As a way to celebrate this year’s anniversary (the 10 years of Klaustoon’s Blog, I mean, not the advent of Blade Runner’s 2019), the next months will see some posts looking backwards to past events. And amongst them, a few will deal with events from last year, 2018, which was a rather busy period for me, full of Klaus-related lecturing, exhibiting, and traveling. This busy-ness had the less happy side effect of my neglecting my obligations towards this blog even more than I usually do (which has been a lot, in recent years). Let’s start, then: as I was writing the 10-year celebration post last week, adding links to the text in the right places, I realized I had forgotten to include a publication that came late in the year, and followed the spirit of my contribution to Thresholds #46: Scatter! (which will be reprised again in an upcoming piece for Architectural Design). As things go, while in the Mextropoli Festival in Mexico DF last year, I happened upon Dino del Cueto, and Cristina López Uribe, from UNAM’s Bitácora Arquitectura. I had too much on my plate, but the topic of the issue (Error) was irresistible, and, instead of publishing something already done (as they suggested), I decided to call in my better half, and design a piece on the power of satire, cartooning and caricature. 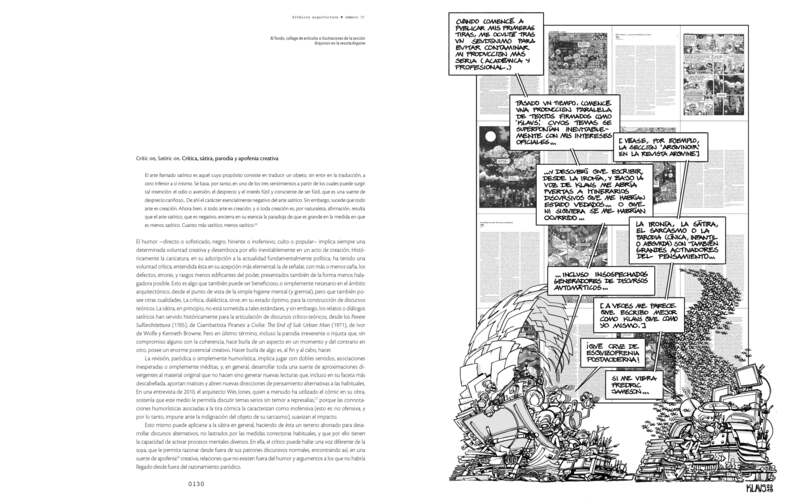 The piece, which has quite a lot of Gombrich, along with quite some Buster Keaton, some LC, Piranesi, Hollein, and (of course) many other referents can be found on the journal’s webpage here (in Spanish). Below you can find a quick English translation of the first couple of pages, interspersed with the pages as published, which have the specially-made cartoons (click to enlarge) in them (I did manage to oblige myself to repurpose a couple of earlier cartoons, one from Thresholds and another one from A10, but, unfortunately, I couldn’t help drawing four new ones; don’t laugh: it’s a curse). Twenty years ago, I attended a lecture given by Federico Soriano, who, armed with his trademark floral shirts and blank stares, began by showing several stills from One Week (1920) , the first film produced independently by Buster Keaton, which revolved around the disagreements of the protagonists regarding the construction of a house. This was a recurrent trope in the films of the first decades of the century, from Laurel & Hardy’s to Charlie Chase’s, particularly when the accessories of modernity came into play: specifically, the many mechanisms that literally transformed the house into a machine for living in. Keaton himself addressed this issue in other films, such as The Scarecrow (1920), and especially The Electric House (1922), adding to a genealogy probably started by Segundo de Chomón with The Electric Hotel (1908) which, some decades later, would find one of its most celebrated moments in Jacques Tati’s Mon Oncle (1958) . However, here the link with the architectural practice was even more straightforward, since the film portrayed the eventful construction -and later destruction- of a prefabricated house, conducted by the protagonist and his wife. The house was a simple two-story wooden structure which, according to the brochure, could be erected within a week’s time -hence the title-, merely requiring to be assembled, following the numbering on the boxes that contained the pieces. This apparently simple process goes off the rails, however, when Keaton’s rival – a spiteful suitor who had given the house to the newlyweds as a wedding present- sabotages the construction halfways by changing the numbers on the boxes. Oblivious to this ploy Keaton’s character continues the construction unperturbed, following what he believes to be the company’s instructions to the T -with hilarious consequences. The resulting building is a caricature of what a house of the time should look like, with uncanny angles, elements rotated and repositioned in absurd places, and many other defamiliarizing twists on the invariants of the typology. All throughout its footage, the film keeps showcasing these strategies that estrange the familiar, displaying floors and ceilings that suffer elastic deformations, rotating walls (a usual resource of slapstick cinema) and, in general, presenting an architecture which is anything but stable and/ or static. The second half of the film shows the house spinning vertiginously on its axis as a result of a storm and, afterwards, travelling on wheels (barrels, actually), once the owners realize that the lot they should have built it in is on the other side of the railroad. Of course, all this only helps make its deformation even worse. As could not be otherwise, the film ends with the eventual destruction of the building, when, following an unsuccessful attempt to move it to the correct plot, the little monstrosity is destroyed by a train, in a kind of benevolent euthanasia, after getting stuck on the railway tracks. In Soriano’s narrative, this film -which has become sort of a classic in modern disquisitions on architecture and housing- was used as an example of incorruptible commitment to a predetermined design process. Keaton’s character represents here the believer in following an a priori chosen method to its ultimate consequences, whatever these may be. This is an approach that understands architecture as a process -autonomous or otherwise- where the success of the final result may be more or less relevant, but is neither predetermined nor predictable when it is unleashed. Also, in Keaton’s film the process is triggered by error, but not by sheer chance. Error is not fortuitous, but premeditated (even if not by the executor himself), and although the initial change that triggers the process is both arbitrary and random (there is not an specific, but a generic goal behind the new arrangement: disorder itself), its execution, within the film’s narrative, is impeccably rigorous. Luis Miguel Lus Arana: Quotidian [T]errors: Hyperbole, Caricature, Deformation and Other Catalysts of Invention. [Excerpt]. 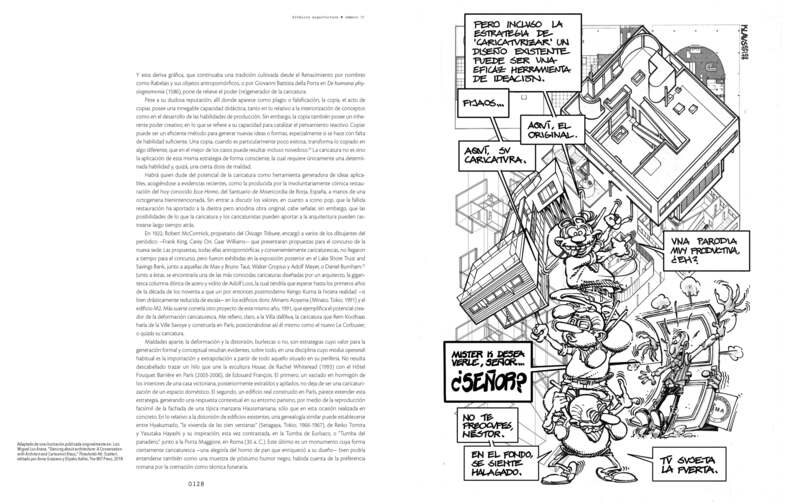 Bitácora Arquitectura nº 37 (2018); 120-135. Klaustoon’s Blog: 10 years and still here. When, 5 years ago, I realized this blog had reached its 5 year mark, and I set out to write an anniversary post of sorts, I distinctly remember thinking: ‘Really? Five years already?’ It certainly felt much less than that in some respects, possibly because producing Klaus-related stuff had been an on-and-off thing with ups and downs, and I was ready to abandon it altogether just every other Sunday. So it’s most disturbing to be writing this at a point that feels about two weeks later. And again, I’m both surprised that time went so fast, but also that it lasted this long: as I commented a couple days ago at a lecture in Canterbury, the ‘let’s just forget about this already’ feeling still persists. Back in March 2014, I had already been working for Uncube magazine for a little over a year, producing my ‘Numerus Klausus’ strip for the ‘Klaus’s Kube’ section at the Berlin-based online journal. 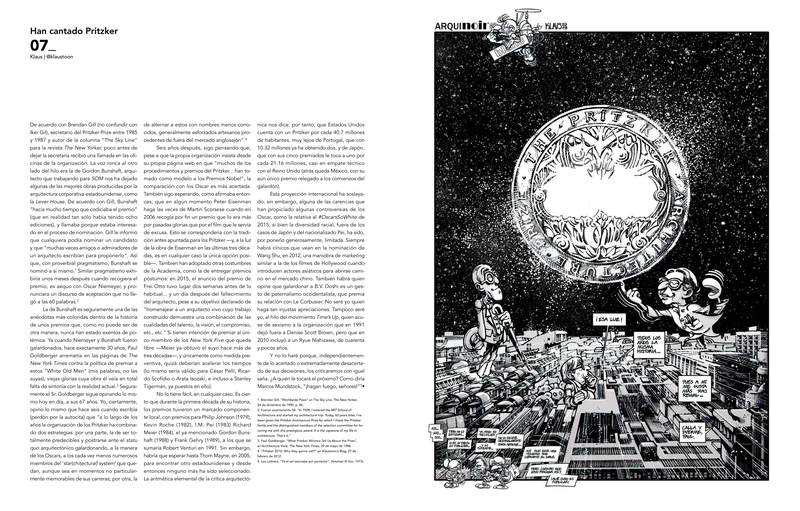 That soon overlapped with a series of cartoons for the ‘Interchange’ section of Dutch magazine A10: New European architecture, thanks to a kind invitation by its then editor-in-chief, Indira Van’t Klooster, who ultimately compiled them all (together with the interviews they illustrated) in the book Forty and Famous (2016). Sadly, both Uncube and A10 went out of business within a couple months’ span in the Spring of 2016 (some posthumous celebration posts coming), but they provided me with a great platform (and a nice excuse) to show and produce my cartoons. And I had so much fun with them. Both editorial teams went on to found their own platforms (A10 coop. and &Beyond), and continued with other projects. 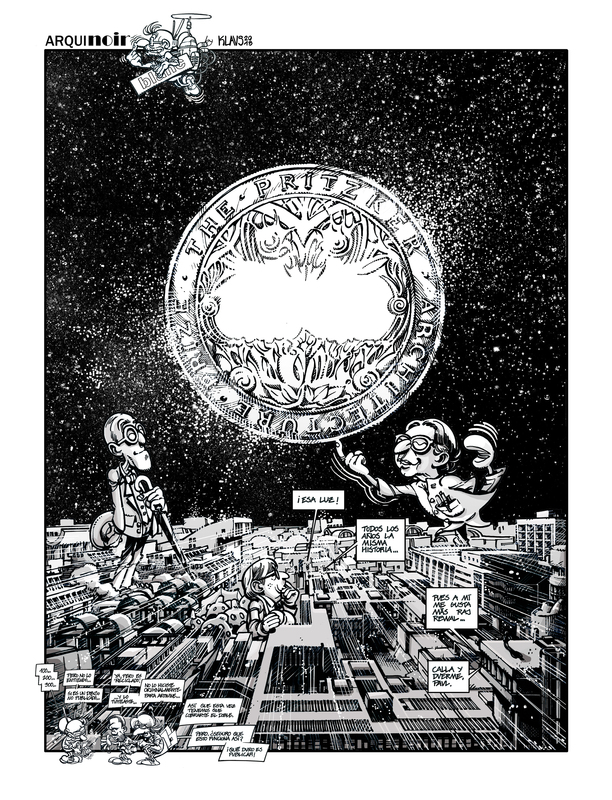 Uncube’s cartoons remain uncollected in paper form, though, so if some publisher out there would like to try his hand at an ‘Artist’s Edition’, complete with sketches, preliminary drawings, and behind-the-scenes commentary, please let me (and Sophie Lovell) know. I was sad to see both magazines go. 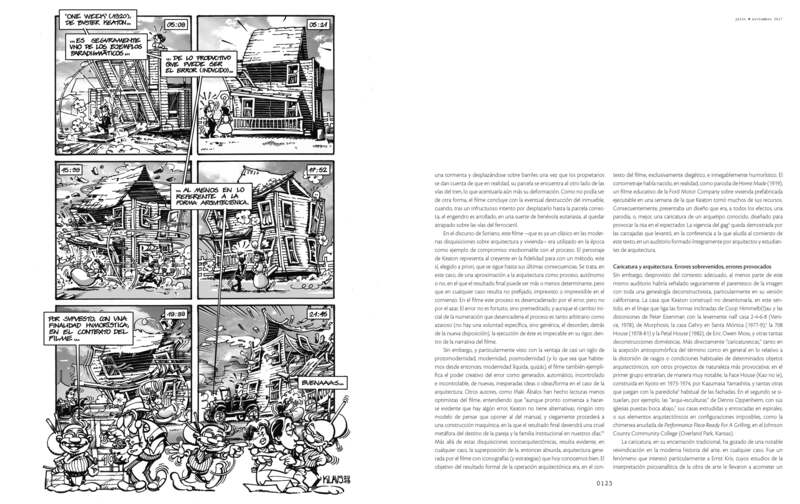 However, even if the crazy 2014-2016 period, with its -for me- intense production of about two (increasingly complicated) cartoons per month, overlapped with my also increasingly demanding academic life, it also witnessed the consolidation of my longest steady relationship to date: the section Arquinoir at Mexico’s leading architecture magazine Arquine, a combination of cartoons and written columns that offers me with a great venue to exorcise my inner demons. 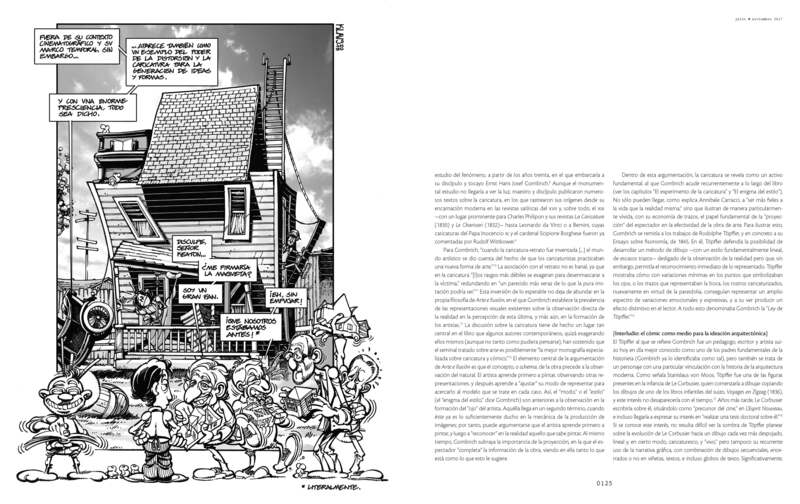 Other writing gigs (together with cartoons), where I can pour some of my own research disguised under the ‘Klaus’ persona have also popped up in the last year, in the form of a conversation in MIT’s Thresholds journal (Thanks to Eli Keller and Anne Graziano), Mexican magazine Bitácora (cheers, Cristina & Dino), and, in a few months’ time (although completed a few months back), in Architectural Design, thanks to a kind invitation from Bartlett’s Luke Pearson and Matthew Butcher. Of course, this is something that was already going on, and continued in yet one more article for Clog with another cartoon -and article- for their 11th issue, simply titled ‘Rem’. 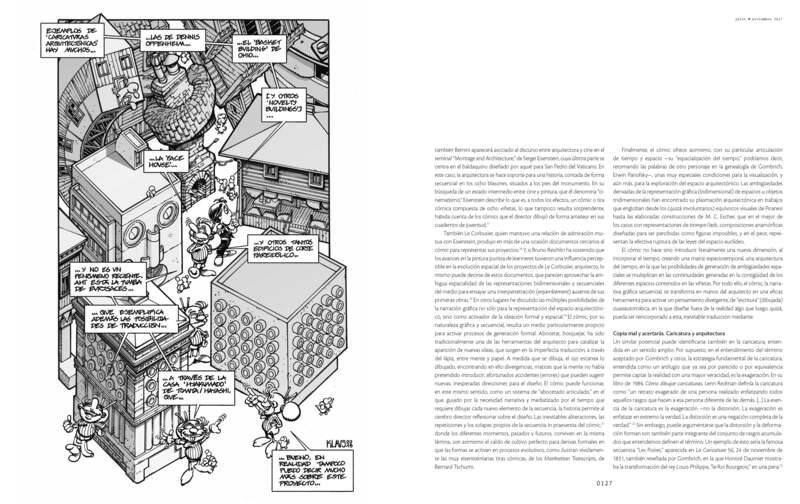 Other nice forays from 2014 were Phin Harper‘s-scripted Terry Farrell cartoon for The Architectural Review, the Table of Contents illustration for PRAXIS #14: True Stories, where I was featured along with some old friends (even if behind the new penname ‘Klaus Roons’ -Ahem! ), as well as Jean-Louis Violeau’s irreverent REM. 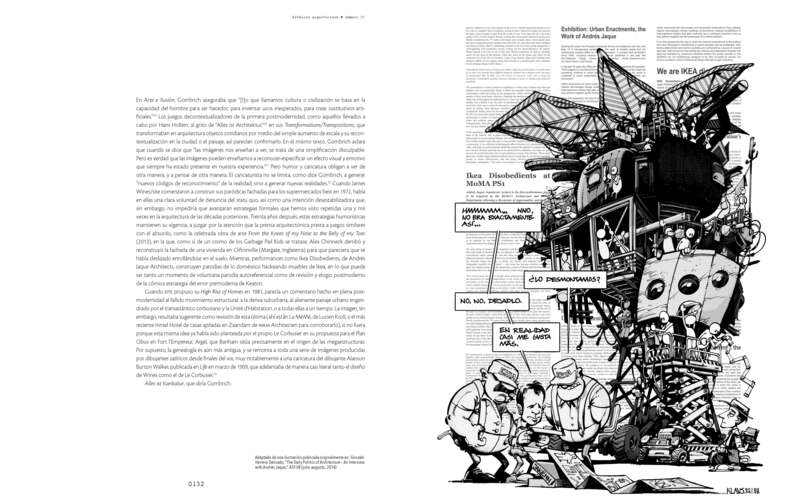 Le Bon, la Brute…, which reused some of my past cartoons on Mr. K. The following year, my work was also the subject of some nice commentary in Gabriele Neri’s book Caricature architettoniche – Satira e critica del progetto moderno (I swear I wrote that review, Gabriele; I just never found the time to finish it publish it…), and an eight-page dossier was published in Arq’a magazine. Finally, an additional -and very big- ‘thank you’ must go to all those Good Samaritans who insist on forcing me to fight my seclusive self and make me travel virtually through my cartoons, in exhibitions in The Art Institute of Chicago, Venice, the Centro Cultural España (post coming) in Mexico or the Pontificia Universidad Católica of Santiago de Chile (yes, another post coming, too). And thanks to those who felt it might be worth hearing about my work in my words. For a few interviews with yours truly, click here and here (Veredes.com), here and here (Fredy Massad in La Viga en el Ojo), or here (Sophie Lovell in Uncube). I got to thank them, too, for also bringing me physically out of my office. Those who know me also know about my natural resistance to talk about my work. But also know that, deep at heart, I love traveling, so thanks for helping me leave my drafting table and speak (in disguise) at the Graham Foundation, Universidad de Alcalá, the Chicago design Museum, the University of Nebraska at Lincoln (post coming again; in the meantime, here’s the poster I designed for them, which was an immense amount of fun) the gigantic Mextropoli Festival in Mexico D.F. (first anniversary post coming soon), Santiago de Chile’s ArqFilmFest (seems some intensive posting is gonna happen in the upcoming months) or, just a little over a week ago, to Canterbury’s School of Architecture (guess what’s coming next week), among others. 5 years ago, I ended my anniversary post with a ‘see you in 5 more years’ time’. So, see you in… 10 more years’ time?